The Aquavalve is a simple but very effective watering device but needs to be treated with care. Keep the Aquavalve and the tray it sits in clean, free of obstructions, soil particles and it will help you water & feed your plants for many years. The Aquavalve is guaranteed for 12 months. The Aquavalve is supplied with all the AutoPot systems. Once connected to the water supply the Aquavalve will control the flow of water to the plants, by simple gravity pressure from a tank or water barrel, no pumps, mains water pressure, electricity or timers are required. Once connected to the tank the Aquavalve will open and allow water to fill the tray, to a pre-set level of 20mm. When the level is reached the Aquavalve will shut off and prevent any further water from entering the tray until all the water has been consumed by the plants. 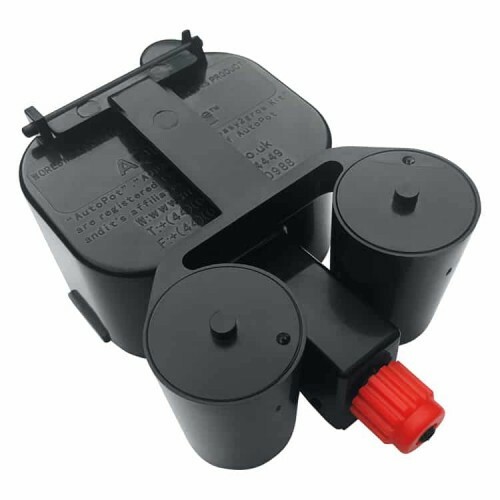 Autopot 15 Litre Pot SquareAutopot 15 Litre Square Pot is a replacement or used for expanding a auto..
Autopot 15 Litre Tray And LidThe Autopot 15 litre tray and lid is specially constructed to allow for..